Gurbaksh Singh’ Hunger Strike Enters Day 41, On The Brink Of Death — Kirpa Kaur | कृति मेरे मन की……. Listening to Indian mainstream media and society, you might have missed this phenomenal course of events stirring up global dialogue from Punjab over the past 41 days. With Anna’s bill getting tweets, ironically enough, from globally infamous human rights violators like Modi, and India busy defending its diplomat’s oppressive labor practice as a source of national pride. It is sad that Gurbaksh Singh’s is a name yet largely unheard of in the Indian mainstream. 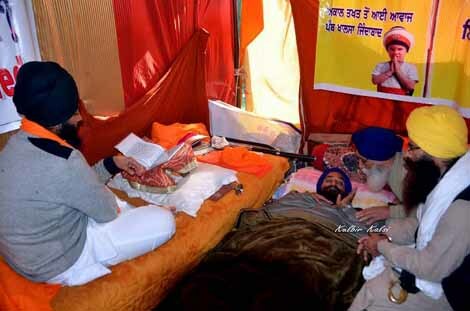 Since November 14, one man, a Sikh farmer, has been using his body as a means of protest to highlight human rights violations against prisoners, protesters and advocates of human rights. He is literally killing himself to bring attention to the cause. 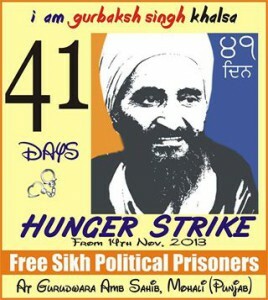 Coverage or not, Singh is steadfastly committed to the cause and is demanding the release of six prisoners who are among many other political prisoners identified by human rights activists in Punjab as being held without due review (the oldest of the list of 118 prisoners, being 94-years-old). These men were swept up during the state oppression and genocidal violence after 1984; the landmark year when the Sikh Golden Temple (Harmandhir Sahib, Amritsar) was stormed by the Indian Army on a day of religious celebration, directed by Indira Gandhi. With thousands massacred by gunfire, tanks, beatings and burnings, hundreds became actively involved against the Indian state and fighting against its injustices. Over the next decade Punjab experienced mass human rights violations and the disappearances of thousands of Sikh men and women, most of whom are believed to have been killed in fake encounters and others locked up for almost three decades now. Given the exigency of the situation, global media including CNN has created space for coverage, dialogue and updates on the most current of events . Canada’s official opposition party, the NDP, has released a statement of concern and urgency after meeting with India’s High Commissioner ; and USA based Sikh organizations have collectively released a statement. During 1984 there was an enforced media blackout not allowing for news to leave Punjab. I wonder, what is stopping the press today? With State oppression an already difficult feat, what happens when the people’s press only works to reinforce the injustices of the day? What will it take for Gurbaksh Singh to be heard?